Thank you, Ed, for organizing this roundtable and assembling such a diverse and interesting group. I hope that they will find at least some of what follows as interesting as I found their remarks. Broadly, being like Black Jacques means, I think, letting yourself be seduced by your dreams, pursuing them, sending them flowers, and never noticing, or caring, that people are laughing at you behind their hands, never even quite noticing, at last, that you’ve made a fool of yourself. And being like Fat Hank means being ashamed of a dream, sneering at it, pushing it away, abandoning it as foolishness, and having it haunt you, having it leave a cold, empty spot right behind your breastbone, as if you had swallowed an ice cube when you drained your drink. But the two strains have become so mixed and confused along the Leroy line (if they were ever really distinct, for there was some Hank in Jacques and some Jacques in Hank) that the voices of Black Jacques and Fat Hank sometimes speak to me at once, and I can’t always tell which is which. To me, Peter’s essential effort is to recover what he has lost to time, what time has taken from him. He can’t, of course. He’ll fail again. He fails at most of what he attempts, and yet, in the telling, in his accounts of his failures, there is that sense of buoyancy, for those who feel it. It is, I think, meant to be a gift, a gift from Peter to you. He manages in the reconsideration and reconstruction of his past, his failures and his losses, to rise above them, and he’s happy to take you with him, if you will allow him to. For the obsessive memoirist, the actual living of life is a blessing and a curse. Diurnal existence, with its quotidian comings-and-goings, provides the raw stuff, the basic and essential substance of the memoir, and that fact, the utility of life as lived in providing the ingredients for the memoir-baker, if only at the daily-bread level, makes life worth living, but the mind is not content to eat life raw, so the stuff of daily life is just grist for its mill, and the mind requires some time to do its grinding. The memoirist requires some time to do the writing, and the revising, and the re-revising and on and on until the life in the memoir, the life on the page, has found and memorialized what wasn’t evident—perhaps wasn’t even there—in the chaff of the lived day. I guess that’s not quite right. I suppose the mind does eat life raw, but in the manner of a ruminant, cycling the stuff round and round again, chewing its cud until the mash is digestible. For the memoirist who invents as much as he records, living life is only half the fun. Life is a rough draft. The mind remakes it, revises it, and rewrites it, unwittingly through memory, deliberately through the imagination. To what we have actually experienced we add our thoughts about those experiences, and we transform them in the process: the unexamined life is not worth living. We also transform our actual experiences by including in our accounts of them not only the facts but also the possibilities: the unimagined life is not worth living. It is rare for a country and a language to acquire four major poets on one day. This is precisely what occurred in Lisbon on the eighth of March, 1914. . . . It remains one of the most remarkable phenomena in the history of literature. Suddenly, in antithesis to the appearance of Ricardo a new individual burst impetuously onto the scene. In one fell swoop, at the typewriter, without hesitation or correction, there appeared the “Triumphal Ode” by Alvaro de Campos—the ode of that name and the man with the name he now has. I created, therefore, an inexistent coterie. I sorted out the influences and the relationships, listened, inside myself, to the debates and the difference in criteria, and in all of this, it seemed to me that I, the creator of it all, had the lesser presence. It seemed that it all happened independently of me. And it seems to me so still. The system of dualities around which the fictitious reality is organized is not built upon what dialectics calls the identity of contraries, but, rather, on their reciprocity: they are not eventually united in a superior synthesis but instead coexist as different elements, which nonetheless attain full reality only as a function of each other . . . while neither of the two loses its identitity in an intermediate, hybrid blend; . . . and it is this relationship of antagonistic fraternity, of jarring proximity (like that of the scents of lemons and of decaying human flesh in Jaffa) that fascinates Flaubert. As his memories of the courtesan of the Nile and of the cemetary in Palestine prove [see letter to Louise Colet, March 27, 1853], such dualities are possible in real reality. In the fictitious reality they will be necessary. In real life they may manifest themselves; in the fiction, things, persons, and events will give the impression of manifesting themselves only through dualities, in the form of contrast, as in these cases, or in the form of resemblances. The diagram below illustrates in schematic form the situation of the author within the world and of the author’s worlds within the author’s brain, including the author’s imagination. The area outside the outermost ring represents the ambient reality through which we all move and from which we get everything we know of everything there is. This is what Emerson called “the actual world—the painful kingdom of time and place.” For Peter Leroy, who is a fictional character, it is a place not quite so real as ours, though still a kingdom and sometimes painful. The first ring is the author’s persona, a thin protective shell around the author within. Notice, however, that the ring of persona is gray and fuzzy, as are all the areas in the diagram. These qualities in the schematic, grayness and fuzziness, are meant to indicate (1) permeability, the fact that information can pass through an area (in both directions) and (2) imprecision, the fact that the boundaries of the regions are ill-defined, not sharp and precise. So, the persona is a kind of semipermeable membrane, through which information about the real world can pass into the region of the author and through which the products of the author can pass into the real world. So, all the ideas, and all the characters, in the author’s mind began as perceptions; however, all perceptions are misperceptions, because our senses simplify and distort what we perceive, and, an instant later, the intellect has further distorted and simplified the already simplified and distorted perception and categorized it and filed it for reference in the memory, so that it is now only a recollection of a perception, a shadow of its former self, and—by some mysterious process still poorly understood despite the best efforts of students of consciousness—these memories begin an apparently inevitable drift toward the region of the imagination, where they are massaged and amplified and bent and twisted until they are scarcely recognizable as the offspring of the bits of the outside world that gave rise to them. Thus, Scrooge’s undigested bit of mutton becomes the Ghost of Christmas Past, and thus there are no immediate experiences, and thus there are no characters drawn directly from life. The stuff of fiction, all of it, is conceived somewhere in memory; that is to say, somewhere along the path from the real world to the region of the imagination. Our imagination, and our dreams, are forever invading our memories; and since we are all apt to believe in the reality of our fantasies, we end up transforming our lies into truths. Of course, fantasy and reality are equally personal, and equally felt, so their confusion is a matter of only relative importance. . . . I am the sum of my errors and doubts as well as my certainties. Suppose someone could look down on the life of a man from a great height, . . . how many disasters would he see in store for it! Man’s birth is painful and sordid, his upbringing wearisome, his childhood fraught with dangers, and his youth hard-won with toil. Old age is a burden and death a harsh necessity; armies of disease close their ranks around him, misfortunes lie in wait, ill luck is always ready to attack. There’s nothing without its tinge of acute bitterness, quite apart from all the evil things man does to man, such as the infliction of poverty, imprisonment, slander, dishonor, torture, treachery, betrayal, insult, litigation, and fraud. . . . However, I am here, and with a mixture of ignorance and thoughtlessness, often with forgetfulness when things are bad, or sometimes hope of better things, with a sprinkling too of honeyed pleasures, I bring help in miseries like these. He’d be quoting, of course. He’d be quoting Folly, in Erasmus of Rotterdam’s Praise of Folly, but I think the words could as well have come from Peter, if he’d thought of them first. It happened one summer when we were boys at summer camp together. There we took a course of instruction in lifesaving. Matthew was not a strong swimmer. I was. In the final test, each boy had to swim from shore to the middle of a small lake and bring back a victim, another camper who had paddled out in a canoe, thrown himself into the water, and begun thrashing convincingly. The instructor impressed on all of us the likelihood that the victim would resist help, and he urged the boys playing victims to resist fiercely, to work themselves up to a witless panic. Matthew played victim to my lifesaver. By the time I reached him, treading water had tired him. The panic he simulated was very convincing. He fought me with a furious irrationality that I couldn’t tell from the real thing. I couldn’t get a grip on him, but he certainly got a grip on me. He pulled me under, and I was taken by surprise, caught without a breath. When I fought free of him and regained the surface, I was gasping, spluttering, and humiliated. A maniacal fire flamed in Matthew’s eyes, and he reached for me again. I turned away from him and swam back to shore. The instructor pulled Matthew into his rowboat. Neither of us ever got our lifesaving certificates. Doesn’t the happiest group of people comprise those popularly called idiots, fools, nitwits, simpletons—all splendid names according to my way of thinking? Perhaps what I’m saying seems foolish and absurd at first sight, but really it’s a profound truth. . . . They are . . . untroubled by the thousand cares to which our life is subject. . . . Now, foolish sage, please count up for me all the nights and days when your soul is tortured by anxieties—heap all your life’s troubles in one pile, and then at last you’ll realize what the evils are from which I’ve saved my fools. Add the fact that they’re always cheerful, playing, singing, and laughing themselves, and bring pleasure and merriment, fun and laughter to everyone else wherever they go as well, as if the gods had granted them the gift of relieving the sadness of human life. For me, Peter’s memoirs seem to be almost completely about loss. It is true that no one dies in Flying, but over the course of his memoirs Peter loses everyone who is dear to him, and those who are dear to him lose those who are dear to them. His mother loses the love of her life when Buster Leroy is killed in World War Two. She settles for his brother, Bert, who is forever unhappy knowing that he was her second choice. Peter loses his maternal grandparents, Herb and Lorna, and discovers after their deaths that he never really knew them, never knew the secret that they kept throughout their lives. Peter admits that his best friend, the best he has ever had, is his childhood imaginary friend. Peter loses his great-grandmother, his paternal grandparents, and the man who played a mentor’s role and may have been his actual father. His mother never achieves the self-respect she yearns for, and when Peter tries to help her win it, he fails, and the enterprise sinks. Peter and Albertine struggle to make a go of Small’s Hotel, but they fail, and they lose the hotel. And Peter knows what will happen to him if he loses Abertine: he will become the Matthew Barber of Reservations Recommended. Of all the programs that I listened to on that radio, I can remember only one clearly: one about a boy about my age who lost everyone who was dear to him—his mother and father and grandparents and a clever younger sister with a voice like a flute—in a shipwreck, and was left alone, entirely alone, on an island somewhere warm and wet and windy, and called out for them in the night, calling against the persistent, overpowering sound of the wind and the sea, and listened in despair for the sound of their voices through the crashing surf and howling wind. Gumma was fondest of the cursor. From her first off-season job installing screws in the shiny little metal frame that holds the cursor in place on the stock, she had worked her way up to chief checker in the cursor department. Despite the effort that Gumma and her dedicated crew put into making the hairlines in the cursors fine and straight, the slide rule remained an imprecise device. For discovering the final digits of an answer, the user had to rely on interpolation, on imagination. It was this quality of the slide rule—its bringing the user not to an absolute, indisputable answer, but only within the realm where the answer could be more or less accurately imagined—that won Gumma’s affection, that made working with the rule as intriguing a pastime as reading detective stories. What Gumma understood at once—and she was always just a bit annoyed by the fact that she couldn’t get anyone else to regard this fact with quite the awestruck reverence that she did—was that the hairline in the cursor did not reveal the answer to a problem: it concealed it. The edges of the hairline defined the limits of the range within which the answer lay; therefore the answer itself was under the hairline somewhere. We’ve had many interesting opinions on this book. In favor of Kraft, we have Sarah Weinman, Brian Francis Slattery, Kathleen Maher, Jason Boog, and me. Against Kraft, we have Matt Cheney, Robert Birnbaum; and Dan Green. On the fence (or perhaps on the wing) are Nigel Beale and Anne Fernald. I agree with Brian that Kraft’s jokes would go over well in bars. But I would answer that the bars in question no longer exist in the present. Perhaps they are entirely illusory. Let us consider the DVD that Peter and Albertine discover entitled “Jack and Jennifer’s Dream.” Here is a scenario in which Jack and Jennifer, who run a hotel with a “former-tumbledown-millhouse look,” not only implore our happy couple in the present to enjoy themselves, but present a slim paperback book called “The Story That Is Jack and Jennifer’s.” We are presented with a story detailing how the Yucatan Honeymoon Midnight Snack came to be, and it’s terrible. Mind-numbingly naive. You simply cannot trust it. Kraft then follows this with the DVD found in the room, where the dream becomes a pitch to open a franchise. It’s a sad and hilarious moment. Something that suggests that these nonexistent dreams can now only be communicated through some bizarre entrepreneurship. The desperation contained within this pitch suggests very much that dreams, even terrible and aimless ones, do matter very much. But perhaps these dreams are only attainable through the confines of fiction or Leroy’s “memoirs.” So while Brian may chide our good Marcel for inhabiting his cork-lined room, what’s worse? A tangible set of volumes (a set of Proust in lieu of of a set of Hawthorne) that emerges from this sense of dreaming or unimaginative authorities attempting to rectify or place monetary value on such seemingly aimless drifting? As to Sarah’s question about earnestness, I’m going to have to disagree with her. And it may be because I had a slightly different reading interpretation than she did. Peter is certainly making a earnest effort (that niceness that Matt mentions) to tell a good yarn, but is he really being all that earnest? The lovely aerocycle may be an amicable chatterbox, but, instead of Peter presenting some of his more negative feelings, the Spirit of Babbington is largely a place for him to kvetch. And Peter betrays the Spirit by leaving her the garage. That particular moment was especially sad and moving for me. Because it represented an emotional transference of what Peter doesn’t have the courage to confess in his memoirs. This imaginary manifestation, who exists in the past almost as a surrogate Albertine (with the stewardess coming in to fill that role later), becomes nothing less than a dumping ground. And that, irrespective of the positive places that Kathleeen brings up, seems to me especially tragic. The idea of dishonoring the wonderful entity that you created in your imagination. Very much like Don Quixote. But unlike Quixote, Peter isn’t really mocked for his efforts. He’s secured an entire subjective realm through his memoirs. But should not some of this be challenged? Should not some of this be mocked? Is it entirely fair to Peter to have him continue like this? Shall we send a case worker over to the Kraft household to ensure that he is treating his creations well? Maybe this is also where the chapter headings that Jason likes so much come into play. Is it really fair for Peter to label a chapter “THE SECOND MOST REMARKABLE THING IN THE LIFE OF CURTIS BARNSTABLE” when the event in question is really just a replay of the cropdusting scene from North by Northwest? I mean, it’s Peter here who asks Curtis, “Does that sort of thing happen often around here?” “Never,” Curtis replies, “In fact, before that, the most remarkable thing I ever saw around here was you.” As a guy who likes people a lot, I find this especially troubling. Curtis’s two most remarkable things are (a) Peter (a facsimile of the real invented out of whole cloth) and (b) a facsimile of a famous movie scene. Is Peter so self-absorbed that he cannot “remember” what was really great about Curtis? What made him so interesting? What made him a three-dimensional being? Given incidents like this, the ephemera of schematics, magazine ads, and the like becomes more haunting. What right does Peter have to introduce ephemera when his characterizations of the real center first and foremost around him? Or is this the lot of every novelist? I’d be curious to hear what you folks had to say on the subject. I have enjoyed reading and eavesdropping tremendously and have finally more than half the book under my belt. “Taking Off” was slow going indeed, but I am enjoying it more and reading it faster — both seem to help. Exasperating would be my one word summary of the Flying trilogy, or what I’ve read of it so far (that would be a bit more than half). I don’t always hate the narrator, Peter Leroy, although I find him cloying. It’s just that the writing is just good enough to make me keep reading and yet, it misses just often enough to make me wonder if my time might be better spent some other way. For a novel that depends so heavily on boy’s adventure lit, a novel about flying and escape and travel, for a picaresque, these failings are not small. The successes are not small either. It is really funny and some of the social critique is spot on, some of the observational comedy is genuinely funny. But I don’t find it as funny as Joshua Ferris’ Then We Came to An End, even though this is a much more ambitious, richer, and more allusive book. Part of the problem is with me: it’s an occupational hazard of my life that I’m reading Kraft’s Flying next to, on the one hand, Ulysses and To the Lighthouse for my teaching, and mountains of the bureaucratic reading of professors (applications, student writing, copyedited book reviews) on the other. Plus, in addition to being in over my head, I am a very, very slow reader and this is a book to gobble. The book is indebted to the big novel of great ambitions without a doubt: it’s full of Shandeisms and Joycean play. But the alternation between memories of the youthful “flight” and the adult reenactment in “On the Wing” rarely arrive at the kind of momentum of the alternation between Mr. Ramsay in the boat and Lily painting at the end of To the Lighthouse — a much more modest journey, but one with tremendous, mythical implications within the book. Time and again, as I page through Ulysses and then return to Flying, I’m struck by how much more Joyce loves Bloom — and makes us love Bloom — than Kraft loves Leroy. I totally disagree with Sarah’s sense of the heart and mind being widened by the book: I feel myself in the company of a solipsist. I think it’s no coincidence that he has a deep fondness for blowhards, for those loud soliloquists who hang out in bars and diners. I think Kraft is proud of Leroy and amused by Leroy, I wonder if he is Leroy, but I don’t feel the same intense joyous fondness emanating from Kraft for Leroy nor from me for Leroy. Still, there are things that keep me reading and will make me finish the trilogy. I love the trope of the dark-haired woman, always coming on to him, always available, always an anticipation of Albertine; and I love Albertine’s wresting the “truth” of this apparition out of him. In general, I love the intertextual moments where, as Ed promised, the boundaries of memoir and fiction get stretched to their limits. One of the weaknesses of “Taking Off” for me was the lack of such moments of interpretive doubt-casting in the final third or so. I have never read such a funny funny take on the pitiful ways in which small towns try to make their Cheapo Sleepo chain intersections distinct: he has brochure language, of franchises and of unique tourist attractions down pat. But must there be so many of them? It’s just so damn long. I have a little more patience with it than Dan Green, though if I weren’t reading it for y’all, I think I’d have given up. And then, Sarah’s putting it in the context of the fifties and Kathleen’s elucidation of why Astaire in a blurb is apt was a lot more helpful to me than all the other yammering on about the heavyweights of the history of the novel. That’s it for now. I am, as Ed suggested, decidedly on the wing. Apologies for weighing in egregiously late, I’m afraid I overestimated my ability to go without sleep for large portions of February. I have only just finished reading, but my delay in getting to this point so was not, as seems to have been the case with others, and others, a result of disinterest or discontent with the book. My reaction to the first pages was kind of like Matthew’s — uh-oh, the scent of whimsy ahead, and so many pages to go, dear god, the voice and apparent content of this book don’t seem to justify its thickness and weight… but I came around. In the end, I enjoyed it a great deal, even though my experience was fragmented and I probably would have gotten a richer experience by devouring it in a couple sittings, as Sarah (and others?) did. One thing that delighted me were the subversions of expectation that happened simultaneously on multiple levels. I particularly liked the moment right near the beginning when Peter’s getting ready to making the aerocycle in the garage and he very unrealistically hopes that all his friends, who’ve begged off, will show up to surprise him with their dedication and support, etc. When he won’t get out of bed yet because he’s “giving his friends time to surprise” him we feel a little pity for him, since we know that it’s a foolish hope; and when he tries to believe they’re assembling outside under his window and convinces himself that the reason he can’t hear them is because “evidently they were a stealthy bunch, those friends of mine,” we’re amused by the extent to which he’s willing to rationalize to avoid acknowledging the fact that his friends don’t want to spend an uncomfortable day abetting his quixotic adventure. But the joke seems to be on us when he goes downstairs… and they’re all there waiting with his father! On immediate further reflection, though, do we believe that they really showed up? Is the appearance of the ready-to-assist mob of friends (and the teacher) just an extension of the delusional expectation that they might show up? If Peter’s willing to delude himself a little bit, why not delude us a lot? Others have taken issue with the figures and captions. I liked them. I liked the drollery of captioning them with lines taken directly or almost directly from the text as through they were scientific illustrations from a scholarly paper. I found the brunettes a little eerie, in a very pleasing way–a sort of reverse-Vertigo effect, with the woman who inspires them appearing later and perhaps as a construct or amalgamation — the epitome of the available brunette. What Peter really wants is a perfect foil, so does he conjure one up on the page because she could never exist? Also, I have to say I’m going to read Flying again — in a sunny place, in a warm time of year. Context is much. It’s a cold and stressful time of year, and simultaneous with this I’ve been reading Brian Evenson novels and Helter Skelter, the Charles Manson book by Vincent Bugliosi, as well as doing readings from my novel that just came out which is about a drowned boy who throws up monster dogs. Flying, I think, didn’t quite fit in, and I had to get into a different mindset every time I picked it up, so I’m honestly very excited to read it again under more salutary conditions. A quick note this time, because much of what I would say has been said quite well by others, most recently Ann and Nick. I’m still inching my way through the book, but my progress is feeling asymptotic at this point, so I doubt I’ll get to the end, but I have certainly developed a better appreciation for the novel(s). My own preferences, proclivities, and prejudices as a reader keep me from being able to embrace Flying with any great enthusiasm, but the responses of the enthusiasts here are certainly helping me expand my appreciation for it. Ed directed a question toward me that is, I expect, central: “…are you so sure that Peter Leroy is so nice?” He suggests it’s a matter of perspective rather than sentences, and I expect I would agree if I could get past the sentences (by which I mean, I suppose, tone and diction, but the part of me that is revolting against reading the book keeps muttering the word “sentences” in my mind’s ear). Clearly, Leroy possesses many of the qualities of a picaresque rogue, as Jason suggests, and there’s an interesting tension between his presentation of himself and the “reality” that we can guess at beneath the layers of that self presentation. For some reason, alas, I just can’t draw much energy from that tension in Flying. Though, with Ann, I find Leroy’s narration cloying, that’s not an immediate deal-breaker for me, because cloying narrators can be quite interesting — the problem is what she describes next: “it misses just often enough to make me wonder if my time might be better spent some other way.” Once that wondering begins, I can’t continue, because yes, there are other things I’m reading right now that I’m finding more rewarding. Nick’s coming around has given me hope, though. If he can make it through Flying while also reading Helter Sketler and Brian Evenson, I’ll keep giving it a shot and hope for more connections. I had trouble with dramatic tension, or lack thereof, too. Somewhere early on, I decided not to hold it against Kraft simply because that wasn’t what he was up to. No fair judging the writer (in most cases) for failing to do what he never tried to do, and so forth. In fairness, I have the same trouble with Pale Fire, a novel I deeply love and respect, which has games aplenty, but which has zero tension or what we might consider dramatic momentum. This has been a fine exchange and I especially want to commend the pro Kraftians for their zealous advocacy and scrupulous exegesis. The point, finally, here being what confronts most if not all of us in beginning a new book — what is the fair and respectful threshold of escape for a book with which we are not having a fruitful experience? I ‘d be interested in hearing /reading whether my fellow roundtablers have anything approximating a rule of thumb. In reviewing, I think it’s essential to read the whole thing in order to offer a convincing and fair presentation of just how a book failed or succeeded. If it’s truly awful, I skim. But I cast my eyes on every page. In a roundtable, like this one, or in broadcast journalism (as in the hilarious but awful Self example), I’m more forgiving of quitting and less thorough skimming. I felt strongly that I’d just have to beg off this roundtable with an admission of failure unless I finished the first of the trilogy; once that was done, I just kept turning pages: I found that I had some momentum. And I kind of liked it. If I were the author Self skewered, I’d feel sorely aggrieved: and I think, rightly so. Still, Self’s point, which Kathleen (I think) made earlier with her 100 pages rule of thumb, is right: once you’ve given a work enough of a shake to determine its goals, scope, ambitions, and achievments, it’s ok to bail. When reading for pleasure, bail at once! I’m sorry to see this discussion go. It’s funny to me that that something as good-natured as Flying should be so divisive. This seems to be further support for Ed’s remark that Kraft isn’t as nice as he seems on the surface; clearly he’s pushing some buttons. Because nobody here has suggested that the book is, you know, stupid. Kraft is a good writer and a smart guy, and it seems that what frustrates people about him is that he never Gets Serious. For instance, why would someone write such a long book that stays so breezy throughout? Aren’t light, comic novels supposed to be short? Why is he screwing with us like this? Even more interesting, those of us who enjoyed the book can’t quite seem to put our fingers on what we like about him. I compared him to Proust and Nabakov, yet as several people have pointed out, the comparison doesn’t really work—which I agree with, but hey, a guy’s got to start somewhere. Then there’s the Hardy Boys/1950s Americana stuff—but that doesn’t cover the games Kraft plays, either. What I’m saying is that, in some ways, Kraft is something of an original, the sort of guy for whom books by other people only somewhat prepare you to read. He throws together stuff that doesn’t usually get thrown together, and none of us have been quite able to make anything of it. If Kraft were already part of the canon, with imitators and devotees all over the place, we might have the word Kraftian to describe it, because little else would do. Kraft’s doing his own thing, and whether you like it or dislike it, you have to admit that he has a thing he’s doing. In some ways, Kraft reminds me of John Crowley, another author that some people really like and others find totally maddening. Both set up expectations only to foil them; neither play by rules we’re completely familiar with; both seem to be following a different kind of logic, but refuse to reveal what exactly that logic is—and both seem to like it that way. There’s an interesting second discussion to be had about that, about why we haven’t been able to talk about Flying in the same way that we usually talk about books. Perhaps an interesting critical essay to be written—again, if Kraft were part of the canon, we’d have dozens of such essays—that goes through Kraft’s many novels to pull out the common threads among them and the logic that might weave them all together. I’m not an academic and don’t quite have the mind for that style of reading. But I would love to get a look under the hood of Kraft’s work one of these days, to see how the gears turn. The fact that Kraft and his effort have not been negatively assessed, I think, stems from a lack of interest. I can’t comment on whether Kraft is smart and a good writer — the first and only threshold has been whether I found him readable — which I did not. Seeing the author respond to this discussion gave me the possibility that the scales might be removed from my eyes. In short, no go. I wouldn’t say Flying is worthless, however, I’m now twenty pages from the end of “Taking Off,” and still sitting on the runway, not particularly looking forward to the flight. The book, as I mentioned earlier, is amusing enough, but amusing in a TV sitcom sort of way. A few smiles, but a sense that first I could be spending my time much more enjoyably elsewhere; second that the dialogue is inferior to that which I participate in day to day with my more animated, intelligent friends…so why waste the time; why apply myself when I know that rewards are greater elsewhere? But then this thought, instead of being torn apart, examined, exampled…just sort of drifts off into the fog which hangs over this meandering stream of a story…sure, perhaps the narrative itself is supposed to show and tell and fill out the meanings and themes associated with these big ideas…but if they do, I’m afraid the connections are too loose for me to want to tighten them up myself. Not sure if I will find the second wind that took Anne to the end of this trilogy. I’m a late chimer in because I had many problems with this book. Matt’s thoughts echoed mine completely. I made it through the first two sections but have yet to finish the book. Even the obvious set pieces that I know are meant to be funny I don’t find it funny at all. I found a good rhythym at the end of the first section and the beginning of the second, but then it started to drag as the journey progressed. I’m not sure that I have Anne’s fortitude to finish. I felt Kraft winking at me the entire time I read Flying and that annoyed me. The false cheeriness and throwback language felt flat to me. It’s just not my cup of tea. We can’t all like every book. At least one good thing that came out of reading Flying–this discussion which I’ve been finding very illuminating. Regarding the comparison of Flying to Proust (whose “Swann’s Way,” I almost struggled through); Nabokov (whom I admit enjoying); and Pynchon (never got past 100 pages) — these are blurb-writers’ selling points. The blurbs also compare Kraft’s writing to Fred Astaire’s dancing. You may be disinterested in Astaire’s Hollywood dance routines, but accusing him of “lead” feet? Not right. Suggesting Astaire was difficult to follow or understand? Unlikely. Kraft writes easy prose. True, he employs serial references to high and low culture. But love him or hate him, Kraft has rhythm. And although, I suggested Matthew Cheney might want to hang it up for another day, I’ve thought of another approach. Harold Brodkey was a writer who annoyed me so much I used to rip into his stories with furious curiosity and even a kind of vengeance. Most of you may not be old enough to remember him. Harold Brodkey died of AIDS in 1996 and was published in The New Yorker, and The New York Review of Books, where he wrote book reviews and letters to the editor in the same convoluted, highfalutin voice in which he wrote his stories. His Wiley Silonowitz “stories” were long even for the old-style New Yorker. They appeared as quasi-memoirs or roman a clef concoctions about growing up with an adoptive family. The ones I remember best damned the mother and/or sister, despite hints that the father molested him. Then in The New Yorker of 1995, Brodkey wrote a nonfiction “confession” that he was dying of AIDS, which at that time was shockingly honest. If there happen to be others here who remember Brodkey, you’ll know his writing taunted us with the memoir/fact/fiction issue. Except it wasn’t scandalous back then. Nobody expected literature to sit in the witness box and tell the whole truth and nothing but. Readers expected literary work to show us what mattered rather than what indisputably happened. I, with Matthew, am having trouble taking off with this book. Have been slowly taxiing along now for some 70 pages, hoping to leave the ground. It’s a pleasant enough meander through mind and memory –- reminiscent of DF Wallace in a way, though not so self obsessed, so claustrophobic, so micro-managed. In addition to its theme, there’s also an amusing mock heroism to the writing that recalls Don Quixote. I like the passage above too because it sums up, I think, Peter’s sense that ‘truth’ doesn’t really matter. That regardless of what he may say, his interlocutors will interpret his story in ways they want to; just as the media treats its facts. Peter flew a total of 180-200 feet on the way out to New Mexico, but he’s not about to dispossess his fans of the “heroic” image that most seem to hold of him as a fearless, resourceful adventurer. Apropos of this, “Proust famously pointed out that we cannot remember what has not occurred; he might just as well have pointed out that we cannot digress from a route that we had not intended to take.” If people want to see my escapade as heroic, who am I to disagree…they aren’t listening anyway…and in fact, I kind of like the positive attention. Dreams free us from purposefulness. Memory serves as a refuge from a painful present. There’s also a curiosity to notice what wasn’t initially noticed. Memory/imagination as a flying machine, assembled from scratch, or from pieces cut from lived life. Kraft’s prose to this point lacks Proust’s limpid beauty; his consistent, soft, sensual phrasing; but there are hints: I’m impressed with this for example: “the leisurely ascension of the morning mist from the slack surface of the river.” Slack! Very nice. Hopefully more to come, for this, in large part, is what keeps me reading a book, along with its humour, and the strength of its ideas, how well they provoke debate. I’ll check in after another two hundred pages or so, hopefully in totally engaged mode… For now, I look forward to hearing from others. I’m hesitant to even interject my response to the book at all since, if anything, I find it even less compelling than either Matt or Robert. My problem is similar to theirs, however: the writiing is, well, boring, the character’s voice so “nice” the effect, at least for me, is simply eye-glazing. (The long stretches of superflous dialogue don’t help, either.) I’m sorry to say I couldn’t get even half of the way into the first novel before knowing that finishing the whole thing would be a hopeless task. This is my usual response, however, to “clever” novels whose cleverness doesn’t permeate to the level of stylistic liveliness. The supposedly “quriky” story (which in this case for me never rises above mere whimsy) is told in such a bland and earnest way I never find myself engaged by it. My criticism can thus be taken as perhaps just a consequence of my particular reading preferences. Those who don’t share them can listen instead to the other voices in this conversation. Flying has proved my rule that the authors most likely to make an impression are the ones that polarize people. And clearly, this book has polarized, what with me, Ed, Brian and Kathleen in the “positive to the point of evangelism” corner and everyone else who has chimed in so far, well, not having that reaction. Kraft’s books, or at least the ones I’ve read, are written in a kind of deliberate throwback to the narration style that permeated a lot of American literature and storytelling in the 1950s. And since Flying (and most of the Peter Leroy books, for that matter) purport to be a memoir of 1950s boyhood, it then takes on the boyhood narration characteristics of those time. The best example of this, far and away, is Jean Shepherd. No one really talks about Shep all that much anymore and it’s a damn shame, but to wit, he hosted a radio show for years (the heyday was the ’50s, on NY-based station WOR) that was listened to by practically *every* boy of a certain age, usually under the covers when parents thought they were asleep. Shepherd recounted stories – purportedly true, but heavily embellished – of his alter ego’s adventures in Hohman (really Holman) Indiana, but he also did crazy stuff like convince his audience to storm bookstores and order a book that didn’t exist, propelling I, Libertine to the bestseller lists before it was written. And of course there is A Christmas Story, which is based on Shepherd’s tales and after being a minor cult favorite is now aired religiously, wall-to-wall, every Christmas on cable channels. Why this digression? Because if you don’t like or don’t care for Jean Shepherd, Eric Kraft may not be your thing. But Shep was the thing for so many people of a certain age, many of whom never got to see the sights of NYC. Shep had the knack of capturing the Americana flavor even though he lived an urbane, proto-beatnik existence in Greenwich Village (before decamping to Florida) but beneath the whimsy of his humor was a pretty nasty streak. Kids shot their eyes out with bb guns or glued their tongues to freezing poles. It all looked like the gloss of niceties, but beneath that gloss was the beating heart of how kids could be cruel and other dark impulses. It’s pretty hard to be earnest now, or at least ape the trappings of earnestness, because irony and showy styles are so common as to be mind-numbing. Or you end up with commercial earnestness like The Story of Edgar Sawtelle — a good book, but if you poke beneath its Hamlet structure and love of dogs, there isn’t really all that much embedded underneath. But Flying? It certainly looks smooth and easy because Kraft’s using a seemingly accessible style in order to engage (or, obviously as it’s turned out, not engage) the reader, but his is the subtle satire of an earlier age that is so little practiced no wonder some fail to recognize it. More soon, but I hope others who haven’t yet responded will weigh in. And I suspect there’s more common ground between the two camps than we think! Or maybe I’m just a damn optimist, but I can’t help it. I wanted to say thanks to Ed for including me on this spirited round-table. It will be something to behold, all the pro-Leroy and anti-Leroy folks on the same virtual page. First of all, Sarah writes: “Kraft’s books, or at least the ones I’ve read, are written in a kind of deliberate throwback to the narration style that permeated a lot of American literature and storytelling in the 1950s.” As a fan of the old Hardy Boys mysteries, Mad magazine and radio dramas, I cheered when she reminded us of those primary influences. But you know what I love about the picaresque more than anything? The subtitles. This prose form developed the fine art of demarcating episodic adventures with subheadings like: “In Which Our Dashing Hero Meets The Damsel Of His Dreams And Loses Her To An Untimely Accident.” I’ve loved the technique since I was a kid, and I played with them in my novel writing. When I read Spaceman Blues by fellow Kraft-work analyst Brian Francis Slattery, I loved how he broke up his hallucinatory book with literary headlines. I ended up interviewing him about how he wrote those episodic subtitles. He cited William S. Burroughs’s Naked Lunch and Andrei Bely’s Petersburg as the most helpful examples of the form. With dazzling headline breaks like: “Paneling, a Thought Experiment” (p. 146) and “Dreams of a Professional Fool” (281), I hereby add Kraft to Slattery’s list of literary headliners. I’m going to throw another topic out there for discussion, because I’m only one third of the way through Flying and I’m struggling. Here’s my question: What do you make of the narrative voice? Or voices, if you identify them differently? I ask because I’ve been reading the book off and on for a month now, but have only just begun On the Wing, not for lack of effort, but for the fact that all the way through Taking Off I found myself gritting my teeth — I utterly hated Peter Leroy, mostly because of the way the book’s sentences rang in my ears. The writing seemed to me slick, even smarmy, and all I wanted to do was get it out of my head. I kept trying to put my finger on what it was that bothered me so much, that made me grit my teeth as if I’d OD’ed on Smarties, but I didn’t get very far in my quest to figure out what was making me react in such a strange way. The closest I came was when I decided I found the captions to the pictures annoying. I liked the pictures, particularly the doctored pictures of old magazines and books, which were clever and surprising, but the captions weren’t usually necessary, and I resented being given redundant information. I wanted them to do something more, to be in some sort of conflict with the pictures or the narrative, to add complexity rather than just tell us stuff we already knew. But that’s primarily a problem for me only with the captions. My problem with Peter’s narration is harder to define, but I can say that the voice seems awfully, well, nice. Like Leave It to Beaver or My Three Dads. Perhaps this is because, given how fragmented my reading of the book has been, I haven’t been able to get enough sense yet of what’s at stake within it, where its edges lie, and so perhaps I’m missing some big irony or subtle clues to an unseen darkness. (Which says more, I expect, about me than the book — “pleasant” is not, for me, a term of praise for art.) Perhaps On the Wing and Flying Home will add some vinegar. I haven’t yet been able to make myself care about Peter’s various embroideries of the apparent “truth” within the novel’s story because I haven’t yet been able to figure out why it matters whether he’s “truthful” or not, or what effect this should have on me as a reader. It’s late at night and I’m rambling; my apologies. I merely wanted to ask you all for some reports of your reading experience of the book — I don’t know if it will help me get beyond my allergy to Peter Leroy, but I am honestly curious to know how people perceived the book’s narrative voice — charming? engaging? amusing? enthralling? — because I feel kind of stuck in how I first heard it, and there’s no way I’ll make it through the next two novels if I continue to hear it that way. I’m speaking to Matthew Cheney first, because his message pops up first in my gmail. If you’re beginning On The Wing, and Peter Leroy grated on you all through Taking Off, I doubt you’ll enjoy you the rest of it. If it irks you, I would put it down. (Ed may not agree with me on this, because if you push forward, hating it, you might contribute more to the roundtable than all those saying, “It’s so great, so hilarious!”) Generally, I make it a rule to give a book 100 pages–I’m a writer, not a book reviewer–and past that, if I don’t like it, I put it on the shelf. A year or two later, I might try it again. Frequently, it’s that second or third time that the book grabs me. This has convinced me that fiction is even more subjective than real life, which strikes me as so subjective that (quoting Sarah and Ed and Brian) it compares to walking on quicksand. Dr. Bob Wylie suggests a tragic if tangential Quixote-type more than the self-aware, self-conscious but all the happier for it Peter Leroy. Although once you bring up “swagger,” Ed, I see various parallels between Peter Leroy taxiing the country in Spirit and Quixote charging on horseback. I read Don Quixote in college and at that time found it likewise hilarious, perhaps because the teacher presented it that way. Cervantes was skewering the popular (and purportedly kitschy) adventure stories that were popular in the early 17th century. I’m sure there must be dissertations galore comparing those cheap oral tales with DC or Marvel superheroes and/or the 1950s real-life versions of Kraft’s Bold Feats magazine. Easy to imagine that someone might not be in the mood for these hi-jinks, Matthew. And because Kraft does deftly address high and low culture, questions of taste, time, and philosophy in such a seamless, fast-paced style, his prose might come across as “slick.” But that’s the risk anyone takes telling stories. I promised my husband to keep this short. Ha-ha. The poor man suffered along as I insisted upon trying to read passages out loud to him, but mostly giggled.. Among my favorite passages is the one where Judge Whitley takes Peter outside and questions him about Faustroll. Then, too, as someone who too late in life attemped rollerblading too fast and too often, giving it up only after a few full-fledged concussions and a shattered wrist, I especially relished the dog-boarding business. Since I began to read Flying by Eric Kraft late last month — an author previously unread by me — I have begun ten or twelve books, 6 or 7 of which I read to their ends. So, it seems clear this narrative hasn’t exactly captivated me. Like Matthew, I find a few things about this novel unfelicitous — not the least, the, what I experience, kind of leaden exuberance and as Brother Cheney opines, smarminess. I am struck, and a bit bedazzled, by the high wattage of the illuminating discourse — which, if it signals the type of book this is, makes it even less likely for me to complete. I noticed that Proust and Nabakov’s names were bandied about — also writers I have not (I am still trying to account for any significance to the fact I have read virtually no Updike— I have learned to offer this guitlessly) — though I would wager I have read more Nelson Algren than most people. I will dip into this book, perhaps even advancing to various places in the novel — though from what I have read in the commentary, this story seems to be intricately constructed and interwoven with all manner of minute details and cutesy nomenclature. I will certainly look forward to the polylogue, as many of the contributors are people known to me to be sensible, erudite and useful observers. 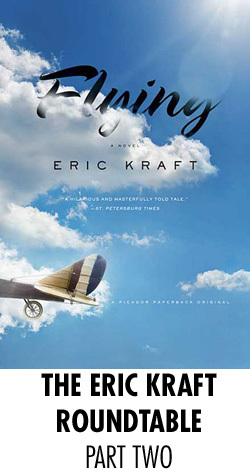 This week marks the release of Eric Kraft‘s Flying, a collection of three novels that include Taking Off, On the Wing, and the previously unreleased Flying Home. This trilogy forms the latest set of volumes in Kraft’s ongoing series of books set in the Peter Leroy universe, which Kraft has devoted more than a million words to. Peter Leroy is a dreamer who has been writing his “memoirs” about growing up in a town called Babbington, New York. But his stories tend to be wild lies. And if Peter is committed to the pursuit of a certain form of truth, why then are his “memoirs” such elaborate yarns? Why is there also so much corresponding ephemera in these books? In the case of Flying, we see two differing narratives. The young Peter builds an aerocycle (that curiously does not fly) and travels cross-country in the 1950s. The older Peter, in the present day, is likewise traveling across the nation with his wife Albertine in an Electro-Flyer. Many of the stories presented in these books conflict or even revise previous incidents that have appeared in the Leroy chronicles. And in an effort to unpack Flying further, we’ve enlisted an able team of readers to offer their thoughts on Kraft’s work. There is also a three-part podcast interview with Kraft coming later in the week as well. If strangers should come into your midst, strangers passing through, visitors from afar, take them in. Try to feel their loneliness, the terrible isolation of outsiders in an alien culture, and if they seem odd to you, if the things they say and do seem disturbingly different from the things that you and your neighbors say and do, please realize that in their loneliness those strangers may be clinging for consolation to familiar customs and trying desperately, awkwardly, ineptly to ingratiate themselves with you. Don’t reject them. Welcome them. The foods they eat, the ideas they hold, the emotions they feel, and everything they hold dear may be weird and worthless to you, but they are neither weird nor worthless to them. Open your hearts. Open your homes. Let the strangers in. It’s hard not to feel like your heart and your mind is opened while reading all of Flying. I know both of mine certainly expanded beyond their natural limits. “Buoyant” was the word I kept thinking of while reading the book, for a number of reasons – it brings to mind a sense of uplift, like the Spirit that Peter Leroy creates and concocts to get him away from Babbington and on to New Mexico; a sense of wonder at how much Kraft builds into what looks on the surface to be rather straightforward prose; the longstanding back-and-forth, years in the making, between Peter and Albertine in their older years; and the way in which Kraft forces the reader — or at least me — to accept the fullest possible spectrum. One more thing, because it’s all too easy to wander down alleyway after alleyway getting lost in thought and analysis — which, I suspect, is part of Kraft’s intentions with Flying and the other Peter Leroy books (so far I’ve read two others, Inflating a Dog and Reservations Recommended, both very different but of course, forever linked up.) It’s hard not to put Flying in context with the plethora of memoirs, real or fake, on the market these days. Peter Leroy seems to tip his hat with constant references to confession and expiation, but there’s a limit to how much he’ll confess and how much he’ll make up. But Kraft also doesn’t want the reader to settle on binary conclusions: Peter Leroy is making things up therefore he is a fake, or he’s telling a good story therefore he’s a genius. No, the wonderful thing about Flying, about all the Peter Leroy books, is how they inhabit the in between spaces, looking at the margins and the scribbled notes that are both visible and invisible to the naked eye. Trusting in one truth means missing out all the others. And really, when it comes right down to it, one never knows, does one? In the later Leroy books, we have also seen a greater concern for a formalist structure. Whereas the earlier books feature an introductory interjection from Peter in the present, the later books present alternating chapters of Peter and Albertine in the present and Peter in the past. Leaving Small’s Hotel, which is almost a prototype for what Kraft pulls off in the Flying trilogy, sees Peter and Albertine about to sell off their hotel. In the spirit of Scheherazade, Leroy tells a new chapter every night of his life in the fifty nights leading up to his fiftieth birthday, hoping that these episodes will serve as a draw to new customers, and Kraft juxtaposes Leroy’s struggles to fix a decaying hotel in the present with a story from the past involving Leroy trying to construct a Flying Saucer Detector and communicate with the town of Babbington through an underground radio network. The destruction that lives in the present is bolstered by the construction from the past. We see this theme crop up in the Flying trilogy as well, but Peter and Albertine seem to embrace the inevitable end to their memories in the present. Instead of operating a hotel, they check into many rooms at other hotels. They are very much strangers passing through (as we see in the passage quoted by Sarah) and they attempt to convey their joy to others, such as the amusing episode with the clerk, in which Peter cadges off power to recharge the Electro-Flyer and Albertine explains the delight of receipts (“It’s a caprice of mine — saving receipts. I keep them in albums — the other people keep photographs. They are mementoes, tokens of the fleeting moments of my life.”). I’m curious what your thoughts and feelings are on Leroy’s need to collect. Why it is so essential to Leroy’s need to tell the tale? If Leroy gets his memories wrong, he somehow manages to authenticate it with various clippings, photos, and other minutiae. But is he really authenticating it? Or is he less of an exuberant hero and more of a tragic Quixote? Why is memorializing the past so important to Leroy? Does he need the past to accept the unexpected developments of the present, such as the rather bizarre notion of dogboarding? Or is he memorializing the past because the present is too unkind to him and does not wish to regard him? And if the past is so important, why then must he avoid confronting the truth through these alter egos? The reader may very well enjoy the adventure, but if the relationship between Leroy/Kraft and his readership is predicated upon auctorial liberation, are the many minds offered here to share stories undermined by the inherently self-serving nature of the project? Or must we welcome all these characters because life is just as much about listening and welcoming odd and possibly lonely strangers who we must not reject? There is also something quite interesting in the way Kraft’s blurring of the real and the fictive subverts odd little truths throughout his books. Leroy’s unusual paraphrasing of Lao Tzu (“A journey of a thousand li begins with a single step”) in On the Wing suggests that the little maxims we categorize under Taoism may not necessarily help us understand the true nature of the universe. Or that the true nature of the universe cannot possibly be understood through any form of philosophy. Lao Tzu certainly doesn’t get Leroy very far. But the talking Spirit of Babbington, whether hallucinatory or imaginative, helps Leroy to get his bearings. Likewise, the typo on the Kap’n Klam sign (THE HOME OF HAPPY DINNERS! ), which has the stiff Matthew Barber (again, an alter ego; but perhaps one debilitating to Leroy’s ebullience) quibbling over whether dinners have feelings, suggests that the joys of imagination can sneak up on us even through a misheard literalism. Is imagination a surrogate for philosophy? Or does the only sane response to an ever-shifting America involve escaping into dreams like Peter Leroy or Walter Mitty? I’m also curious about how you folks felt when reading this book. As Sarah suggests, there is indeed a strange simultaneous feeling of joy and walking on quicksand. (Kraft’s constructs have a tendency to sneak up on you. There were times in which I had to put the book down, so that I could properly process the story beneath the story, and the alter egos behind the alter egos. And yet wandering through Leroy’s imaginative terrain proved terribly intoxicating. I felt a strange compunction to remain puzzled by the inconsistencies.) But I’d like to propose that this is because Kraft is attempting to give the reader a visceral feeling of imaginative detachment. Perhaps to some degree, this detachment makes up for the self-serving nature of the curious Kraft & Leroy partnership cited above. Or maybe he’s suggesting that we’re all pretending like Leroy in an effort to survive. We all have our roles and it’s just possible that if all of us revealed the totality of our interior hearts and minds in a book, and confessed what we wished to remember, that we might likewise accuse each other of being as egoistic as Leroy. I’d also like to get into the notion of “swagger” as it recurs throughout the book, particularly with the MDMC and the strange count at the institute. But I think I’ll step aside for now, and let others offer their summation of the many threads within this quite intriguing volume. That little passage made me laugh so loud that I woke my poor wife, who gets up much earlier than I do. In the course of reading Flying, I actually woke her many times by laughing too much and too loudly; she has grown perhaps to resent Eric Kraft for the hours of sleep she’s lost. I realize that Sarah and Ed are zeroing in on the meat of the book, the sort of epistemological questions about truth and memory and the like. I don’t mean to derail that conversation, either. But the thing that stands out for me about Kraft — who is playing on the same playground as Proust, Nabokov, and several centuries’ worth of other fiction writers and continental philosophers — is how damn funny he is, and not in a no-really-it’s-funny way, like you have to be with some books when you want to encourage certain people to read them, but really actually funny. Kraft’s jokes would go over well in bars; they’d be funnier after three drinks than after one, and I mean that as a serious compliment. The riff about Peter’s father creating an early remote for his TV; the several scenes in various restaurants (“‘What if I’m allergic to something [in the food]?’ I asked. ‘What are you allergic to?’ ‘Penicillin. '”; “The man of the family ordered at once: ‘Corned beef hash, poached eggs, biscuits, home fries, sausage, bacon, a pork chop, extra gravy and a beer.’ He thought for a moment, then said, ‘Make that two beers. '”); the collect call to his father near the end–these and many more are out-and-out hilarious. “Peter?” said my father, as I’d known he would. “Will you accept the charges?” asked the operator. “All right… go ahead young man,” the operator said. “I’ll be home on Tuesday,” I said. First off, of course, it’s funny — in fact, one of my cousins had told the same joke at a family gathering just a few weeks before I read this passage, about how in the days before cell phones they’d use the automated collect-call service to send messages to their parents from pay phones (e.g., “Will you accept the charges from I’ll Be Home at 11?”). But now look at the passage again, this time with your armchair philosopher’s cap on. This little piece of conversation drives straight at the heart of the books–“the notion of the alter ego, and how this creation of identities ties into the telling of the tale,” as Ed put it. In Flying, the tale creates the identity as it goes along, and it’s important that it’s done with such lightness. The big question of “who is this” or “who am I,” whether asked by the author (whoever that is) or one of the characters–a question that so many of Kraft’s predecessors treat with such seriousness — Kraft treats as a game, and the way Kraft plays it, at least to me, it’s a lot more like kickball than like chess. It’s wonderful and refreshing, and in the context of the many works that have preceded it, it seems to have a really nifty point to make (here’s where I really start flying by the seat of my pants). Complete objectivity is, after all, impossible. Your memory of damn near everything is almost certainly faulty in some way or another. And if you spend all your time in a cork-lined room agonizing about it (sorry, Marcel, sorry! ), you’ll never take that trip, or have that beer, or let that stranger in. But it’s not just Kraft telling his predecessors to lighten up. Frank Mankiewicz, George McGovern’s campaign manager, famously said that Hunter S. Thompson’s coverage of McGovern’s 1972 presidential campaign was “the least factual and the most accurate.” Both in the fictional world of the book and the relation between Kraft and Leroy, how much does what really happened matter? I don’t know; but it seems to me that we learn so much more about who Peter Leroy is because he lies, and lies, and lies again, than we ever would have if he stuck to telling the truth.